If you’re like most people, you have a serious sweet tooth and a need to fuel those sugar cravings. Lucky enough for me, I’m not much of a sweets fan; I will, however, double fist a bowl of pasta like nobody’s business. For those of you who have a hard time sticking to a healthy diet when it comes to sugary snacks and sweets, I have some excellent news for you: I’ve created a 45 calorie cupcake that tastes like your favorite 1,000 calorie cupcake indulgences. 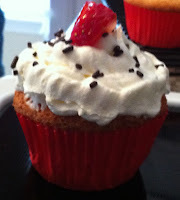 It’s called the strawberry shortcake cupcake, and it’s simply divine. Even for me, an anti-sweets connoisseur, I found pleasure in these delicious little cakes. I made them today for Daniel’s family birthday party, and had no leftovers. Furthermore, when I shared the news that each cupcake clocked in at around 45 calories, people were shocked. Ready to try this recipe out for yourself? I’m sure you are! Here’s a detailed, step-by-step guide, with pictures, courtesy of Daniel (thanks, babe)! Pour the mixed Angel Food Cake batter into a one gallon Ziploc bag, and seal tightly. 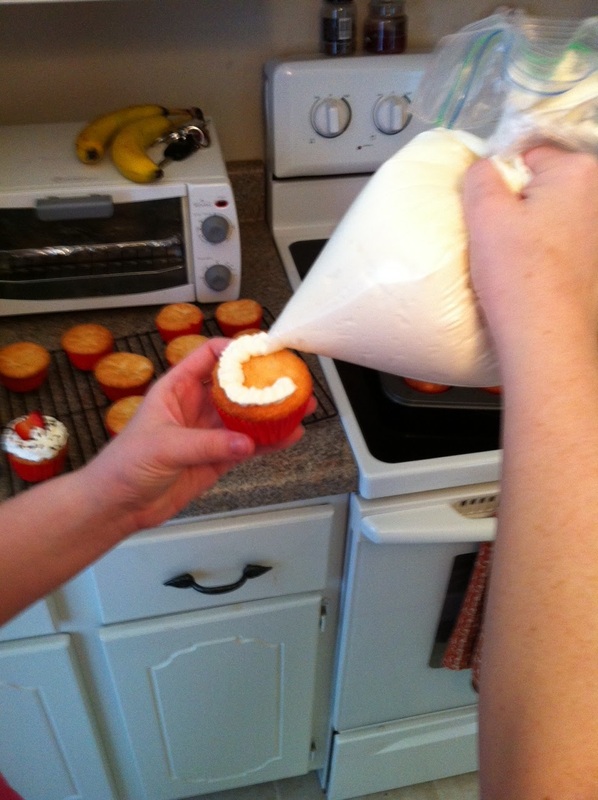 Snip a small cut in the bottom corner of the bag, and distribute the batter into cupcake liners in a cupcake pan. Fill each liner about ¾ of the way full. Putting the batter into a Ziploc bag is my personal preference, because it makes it extremely easy to add the batter, and makes cleanup a snap. After you’ve filled each cupcake liner, add five chocolate chips to the middle of each cupcake and push them down so that they are no longer visible. Put them on the second rack of your oven, and bake for 13 minutes, or until golden. While your cupcakes are baking, start slicing those strawberries! I sliced mine into fours (first halve each strawberry, then halve those halves… if that makes sense)? Anyway, the strawberries just need to be small enough to fit onto the top of your cupcakes. But, we will get to that step in a minute. Once your cupcakes have finished baking, take them out and put them on a cooling rack for about 30 minutes (or until cool). Remember, you’ll be using Cool Whip as your frosting, so you’ll want to make sure they are completely cool, or else you’ll have a giant, runny mess on your hands (and countertop). 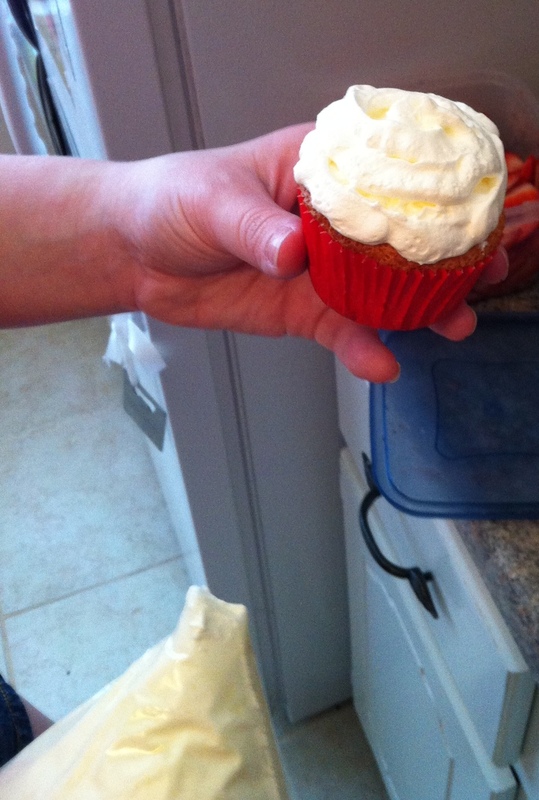 Once your cupcakes are completely cooled, now it’s time to top them with Cool Whip. To complete this step, distribute your entire container of Cool Whip into another one gallon Ziploc bag, and snip a small cut on the bottom corner. Then, squeeze the Cool Whip onto each cupcake in a circular pattern, making sure to cover the entire surface, and build up a little peak so that the strawberries look adorable when they are placed on top. After you’ve added the Cool Whip, you can top them with chocolate sprinkles. Not only does this look super cute, but the sprinkles complement the surprise chocolate chips that are warm and melty inside. Finally, top with 2-3 slices of strawberry by pushing them down into the center of the icing and cake. This recipe is easy, quick and so good it's just ridiculous. Check out the pictures below for some more guided instructions! Adding the chocolate chips! 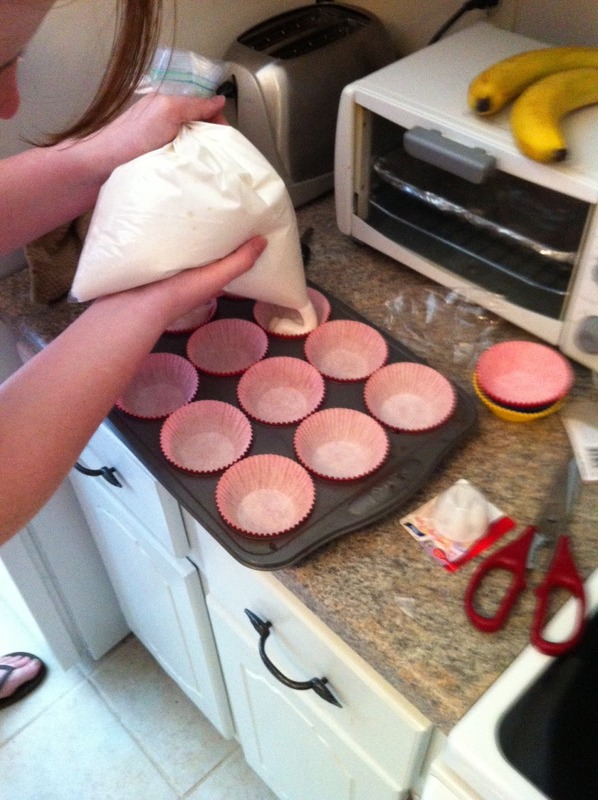 Just make sure to push them down so that they are completely covered by the batter! And, here's how the icing should look after you've finished! Of course, you can add more or less to taste, but Cool Whip is delicious... There was no chance of me scrimping in that department. 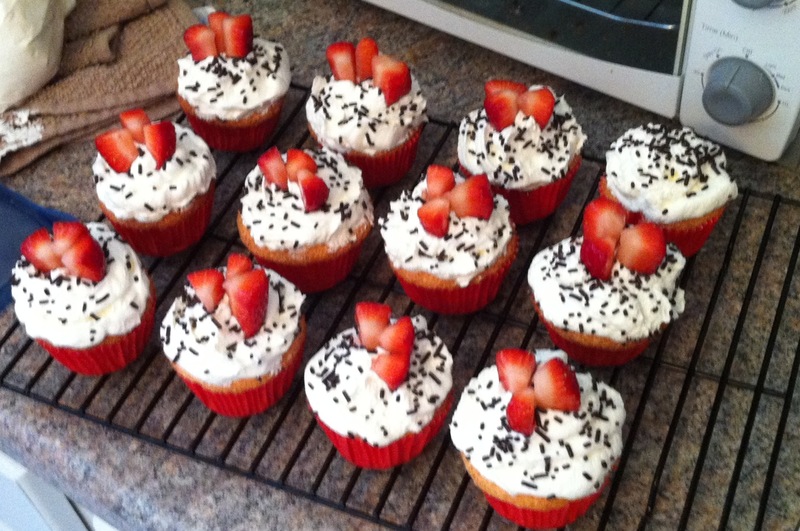 After you've iced them to your liking, you'll coat them with some chocolate sprinkles, and add your strawberries. 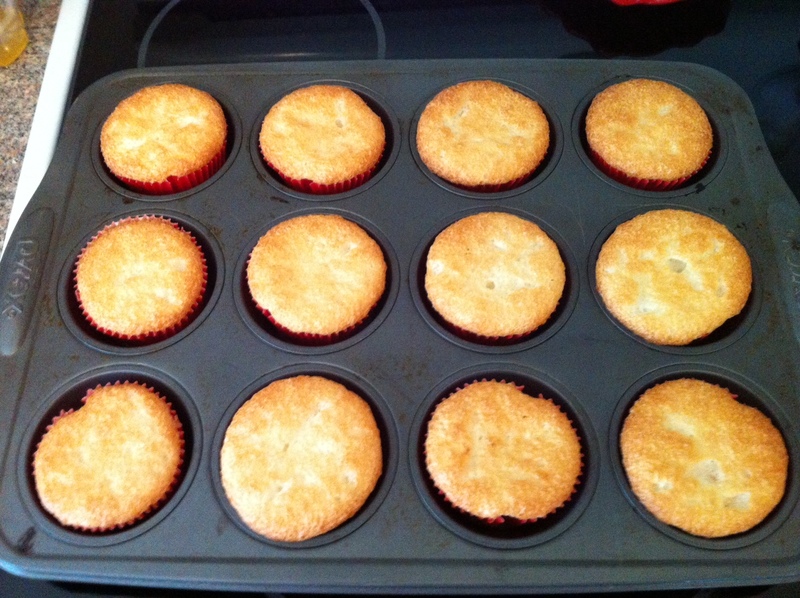 The final product looks like this, and they taste even better! Don't worry, I didn't forget about adding the strawberries to the one in the back; it was made special to accommodate a strawberry allergy. Find more healthy, and delicious recipes on my Nutrish & Delish Pintrest board, here. I’m a total spaz when it comes to pinning healthy recipes; I just can't stop! You’re sure to find something that you’ll love on my boards! Also, if you find a recipe that is totally unhealthy that you want to make healthy, just let me know! I have a knack for turning unhealthy foods into healthy foods, by just swapping out a few ingredients. Thanks for this recipe Katie. I really like to make cupcakes. I can't wait to make these & they look so good! Hey, Kate. I am going to try this cupcake. Thanks for the recipe! You're welcome, Marcia! They are delicious!